The pool can quickly lose its transparency after a storm or rain, but it is not necessary to change the water to keep it clean. There is nothing more beautiful than a summer rain – for that particular smell and for the freshness that it brings after days of very hot weather. But because these storms are usually very intense. They also bring dirt and drag leaves and bugs that end up in the pools, leaving them really dirty. Without you necessarily seeking how to drain water from the pool after rain. 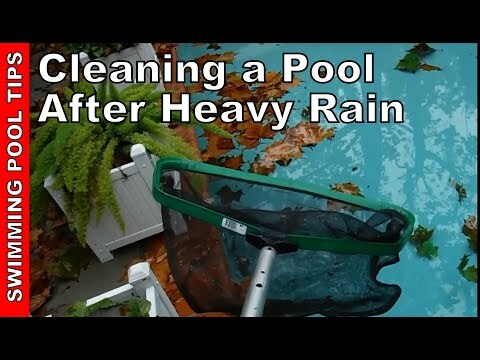 Here, we tell you how to return the pool back to normal after the rain and/or storm. But first, here are what you should expect when the rain comes showering down. First, the surface of the water becomes a layer of dust, leaves, insects, and debris that came with the wind. Also, on the pool floor is accumulated sand, as well as some heavier insects, especially in pools located in large gardens. The grits can also deteriorate the surface of the bottom where they accumulate. The appearance of lichens on the tiles is another consequence. Meanwhile, the water will turn green, since the pH and chlorine are altered. This will lead to the proliferation of algae and fungi. As if this were not enough, the rainwater is usually less cold than the pool, so there is a contrast between the temperature of one and another. And, if the rain was plentiful, it is likely that the suction mouths are clogged with dirt. The panorama seems complicated. But in five steps we can leave the pool again in the best conditions after a medium or heavy downpour. Drain some water from the pool in case the rain has overfilled it: Lowering the level will help to carry out the subsequent steps. The excess water that is to be drained can be used to water the plants if there are any within the garden. Remove dirt from the surface and the suction mouths (skimmers): With the help of a good leaf remover, this task takes a few minutes and leaves the surface clean to have a clear vision when cleaning the background. Clean the bottom and walls of the pool: In very large pools, there are those who do it up to twice, since everything that accumulates there may be too much for a single pass. In this case, between the first and the second cleaning, the filters are cleaned. Stabilize the transparency values of the water: This is done by controlling the pH and adding chlorine. Add algaecide and put the pump to work: A few hours later, attach clarifier, whose function is to group the dead algae, so that they can be collected more simply through the suction. Analyze the pH: Finally, it is recommended that we analyze the pH and chlorine values of the water in case we would need to get it adjusted again. What should you do when it rains? The best way to protect the pool is to cover it with a large prepared canvas during the winter season. In this way, we will avoid that the inclemencies of the weather alter the quality of the water. Also, cleaning it, when the swimming season comes will not be so laborious. Although we are not going to use the pool all that time. It is good that we get used to this routine every time the weather alters the quality of the water. In this way, we will prevent it from deteriorating and we will preserve it correctly until the summer. If we perform the suggested procedure, we will avoid having to drain large amounts of water from the pool to replace it with clean water. This way, thus, we are contributing to water conservation, while enjoying the pool. Let us know what you think about the procedure listed in this article “How To Drain Water From Pool After Rain“. Or your own perception of taking care of the pool when it rains. 3 What should you do when it rains?